I'm attending the Northern Ohio SCWBI (Society of Children's Book Writers and Illustrators) Annual Conference this weekend. I am so excited to meet up with writer friends, old and new. And there's a great line-up this year: Agent Mark McVeigh (from the McVeigh agency), Jennifer Rees, Senior Editor at Scholastic (The Hunger Games editor!) and Martha Mihalick from Greenwillow Press, amongst other successful authors and illustrators. Have fun at the conference...sounds like it's going to be great fun. I'm working up to writing a group of short stories for children. Right now they are just shorties for my little one..LOL!! Sounds like a great conference, have fun! Sounds like a great conference. Wish I could be there. Hope you have a blast. Nice. Sounds like you'll be having a great time and learning loads. Enjoy! Enjoy the conference! How fun. :) And I LOVE the picture. Too awesome! Oh, I wish I lived closer. How much fun would we have had? I mean, I know you'll still have a great time! Can't wait to hear all about it. Conferences are great! Have fun. Have fun at the conference. Did you sign up for a conference with the Hunger Games editor? That would be interesting, for sure. 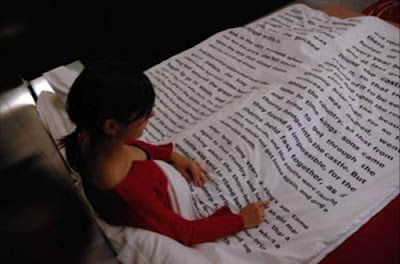 ALso, love the storybook blanket. I've seen it before but stuff like that never gets old. Ever. Have fun! It sounds like a great conference.